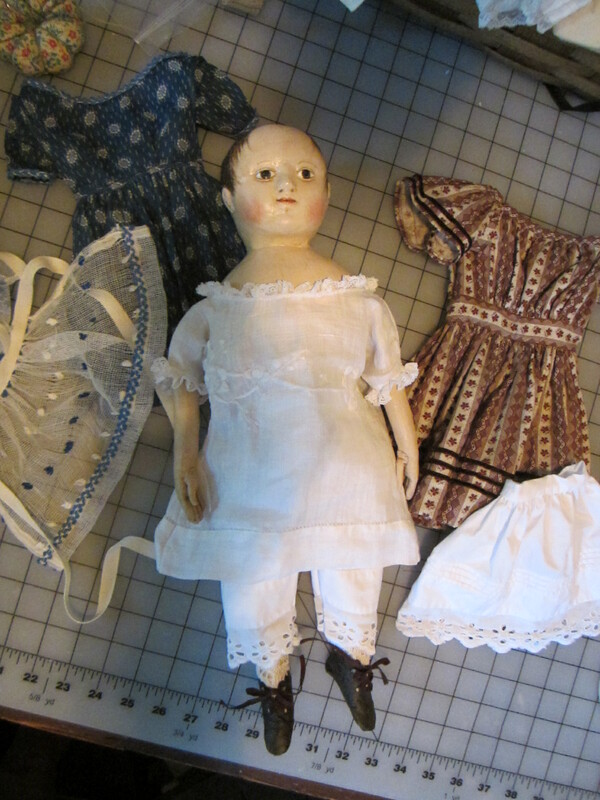 Last spring Mary and her antique Izannah Walker doll, Anna, came to visit. 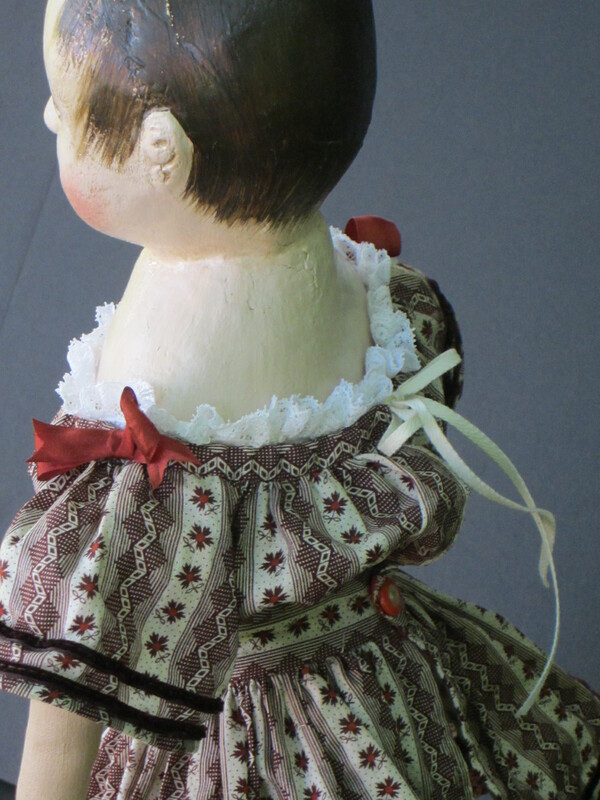 We had a wonderful day with Anna and spent several hours planning a special reproduction of Anna to add to Mary’s impressive doll collection. Mary has been amazingly patient, as I obsessed over all the fine details necessary to accurately reproduce a younger “sister” for Anna. I have to admit that it was a slightly daunting task, as the two dolls will be living in the same household and needed to be exactly the same size, so that they can share clothes. I wound up making numerous legs and feet before I was confident that I had correctly gotten Anna’s tiny bare feet just right! Mary found the antique lace to trim this pinafore. If you look closely you can see the pattern of tiny blue stars in the lace. Mary also bought the antique blue trim that is around the neckline and sleeves of this dress. I cartridge pleated the skirt of this dress. 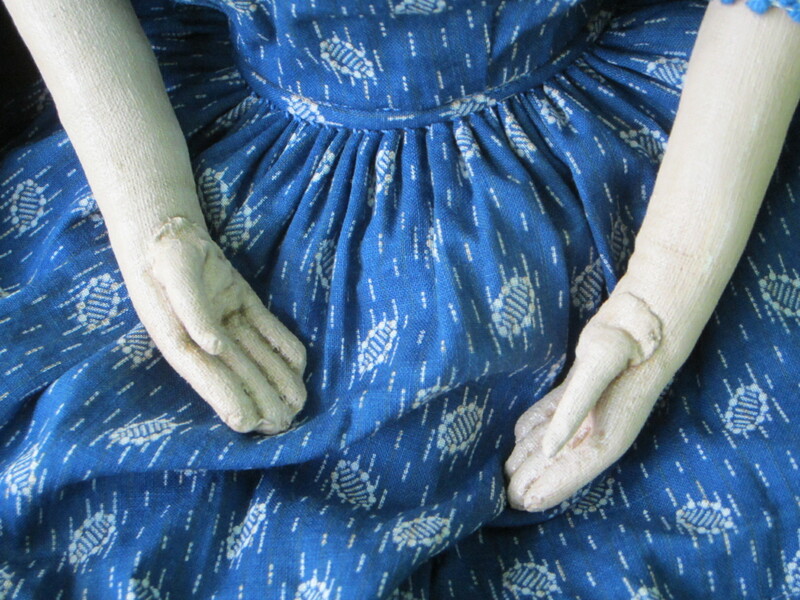 Mary requested thumbs that are folded close to the palms of the hands. 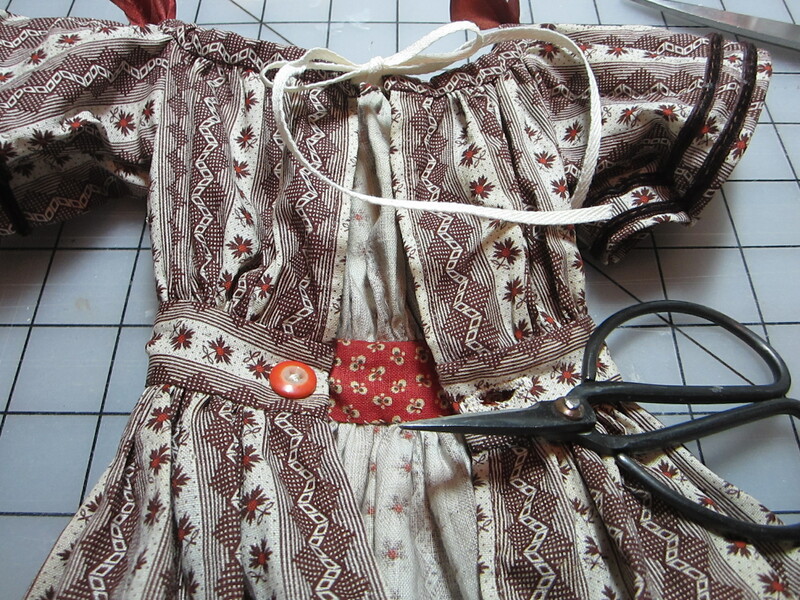 This photo shows removable sleeves worn with the brown print dress. Oh, my. She is just lovely, and your sewing skills are so superb. It must be a joy to create these dolls! Thank you for your kind words! It is pure joy! Paula, I’m speechless!!!!!! But I’ll be back later when I’m not so chocked up. She is just scrumptous! The more you show this mold the more I love her. 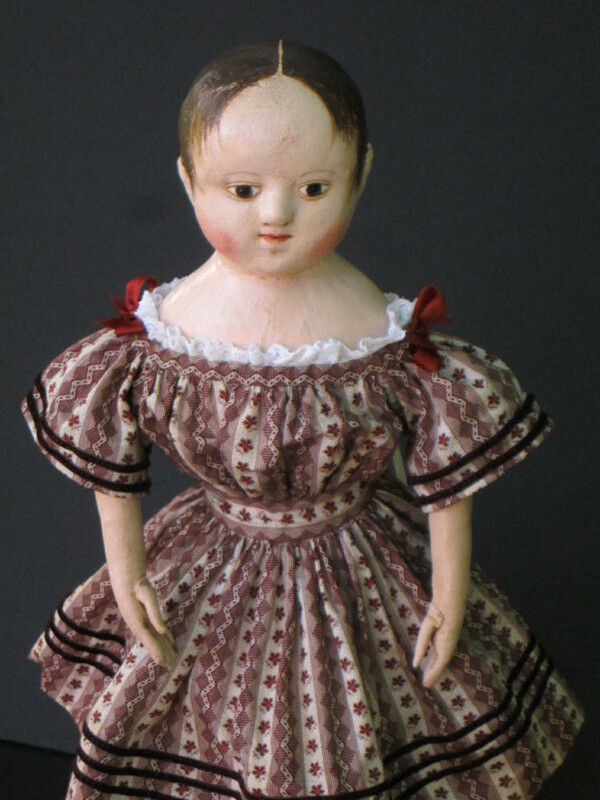 Paula, we had a very busy day today antiquing in Maine but I could hardly wait to get back to the hotel to show my husband the pictures of the doll. She is perfect, and the clothing is superb. You know how much I love your work as I said I wouldn’t have anyone else make the doll for me. 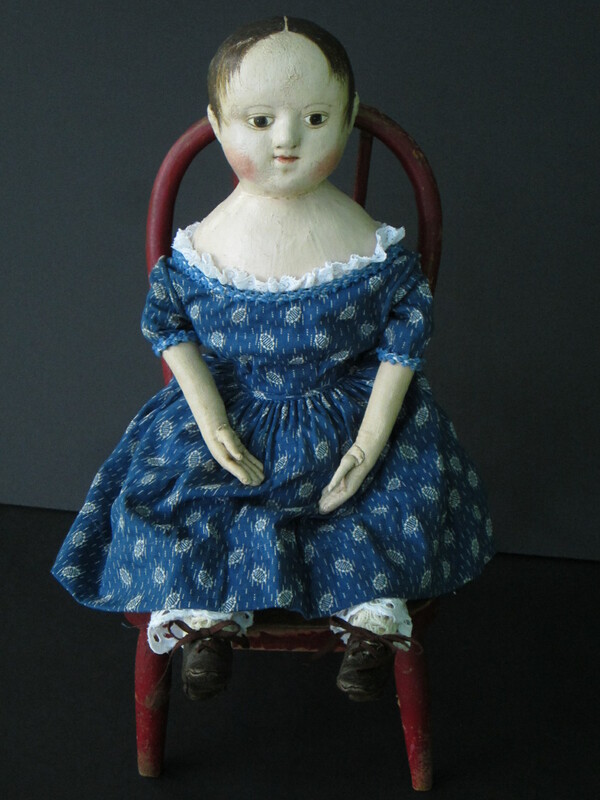 Anna and I hope you will always enjoy making dollies from her mold. She is really special and a very rare doll at that. I kissed her hello when she arrived home with me from the UPS man. When my husband saw the love in me when I opened the box with Anna wrapped up in a vintage quilt he immediately told me we’ll get you another one some day, and that he did. 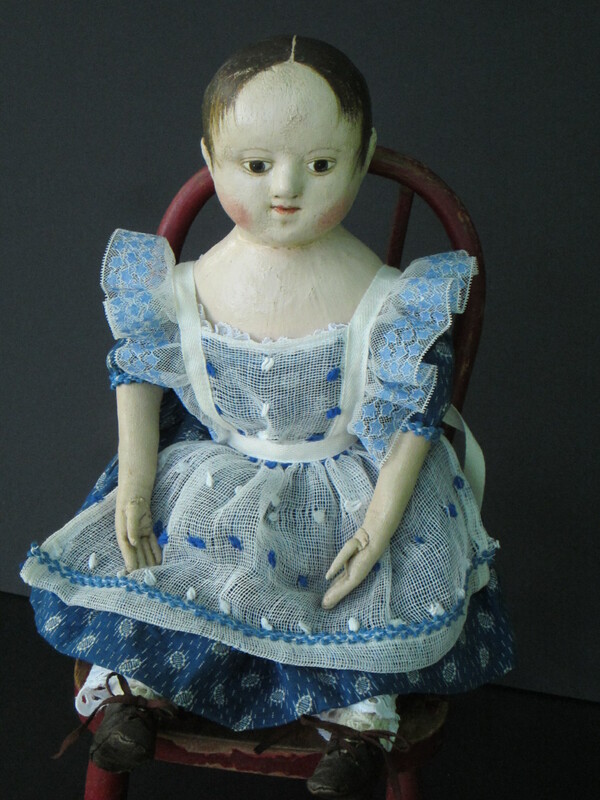 Like other customers of your dolls mine will be handed down as heirlooms to my granddaughters. I’ll make sure they love and appreciate them and what they represent. I enjoyed the entire process of making the molds and waiting for her to come. Truthfully I like the anticipation. You are a loyal and true friend, and that I appreciate. Fondly, Mary G.
Anna is very special! I’m honored to think of you passing Lottie on to your granddaughters some day. I loved planning Lottie with you and making her for you. 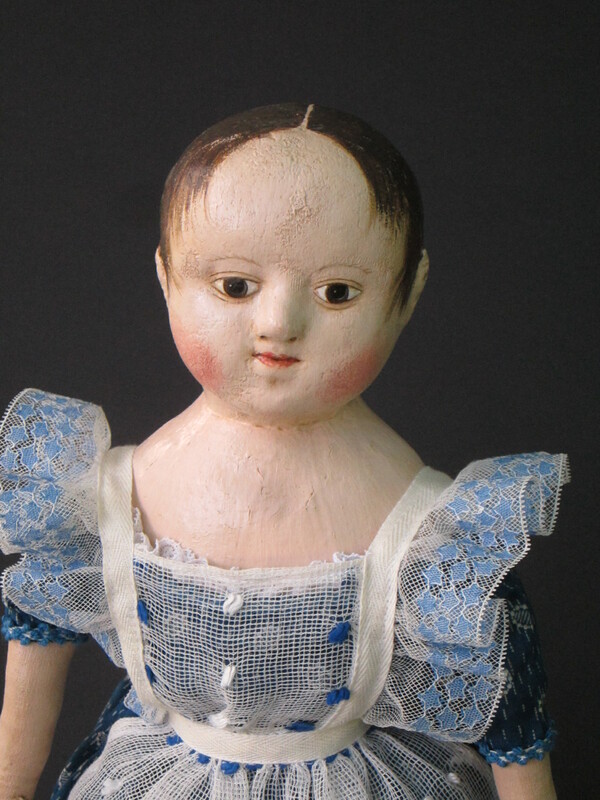 The special antique lace and trim you found really added the perfect finishing touches to her blue dress and pinafore! I think of you every time I use Anna’s mold! She has such a sweet face. 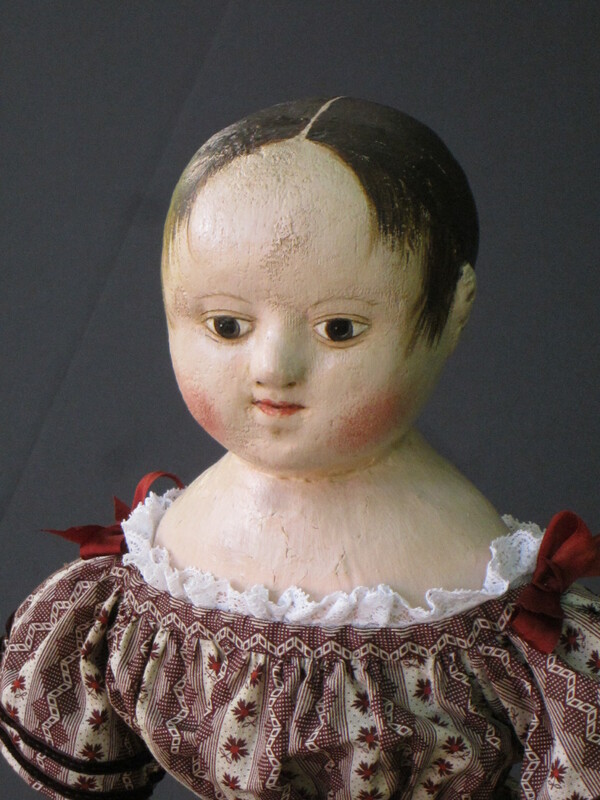 I’m anticipating making one or two “Anna” dolls to take to the UFDC convention. It’s going to be fun to work on them! 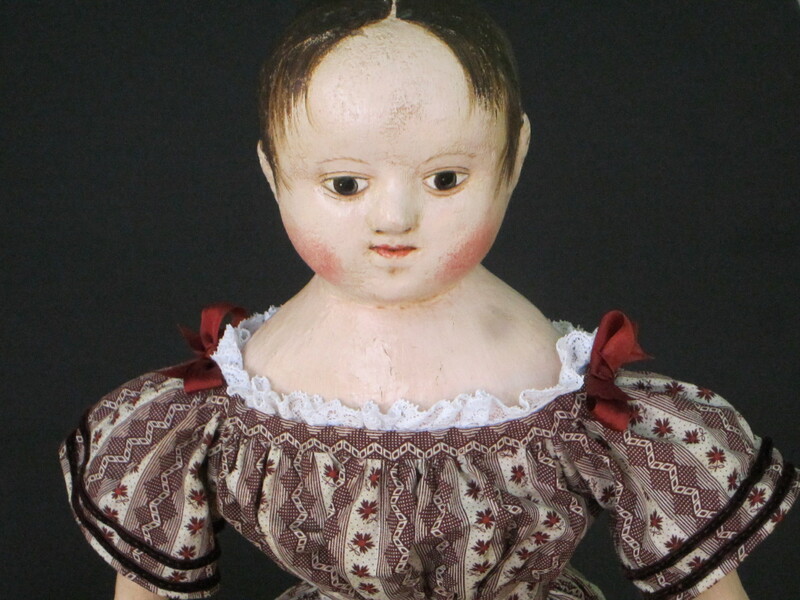 Hi Paula, I had to let you know when I spent 3 days with my 2 youngest granddaughters and showed them the picture of this doll. They recognized her right away. The 9 yr. old wants her Someday. They also could see the resemblance to my original Anna. I feel she is a very Special doll and hope anyone using that mold will treasure her, since she is so different and tiny. Your newest post was great. I’m not sure if I have received my Doll News yet. Maybe in today’s mail. I’m keeping warm and cosy by my fireplace in the evenings. My newest endeavor is I’m learning to weave. My new Ashford Rigid Heddle Loom arrived this week. I’m learning a lot watching the Ashford lady “Kate” doing tutorials on many of their styles. My granddaughters are learning knitting, some from me (I’m not very good at it) and from a lady near their home that gives classes for adults and children at the local knit shop. I hope your Lyme disease has let up a bit. I’ve been seeing lots of concerns about it on tv. Keep warm and cosy by your fireplace as I am. Heading to Florida on the 29th of January. We are flying from now on as I cannot ride any distance any longer. Good luck with your new painting studio. Regards, Mary Goddard. It makes me so happy to know that your granddaughters love your little reproduction Anna too! She is such a sweet doll. How fun! Learning to weave sounds very rewarding. I envy you your knitting skills, since I can not knit at all 🙂 I am feeling much better, thank you. I hope you have a lovely time in Florida!